Well, we arrived safely in Kolkata and there is something about this place, like a piece of art. The hues are rich and vibrant, buildings of lime green and rusted orange, sari’s of fuchsia and yellows. This has to be one of my favorite places on earth. So full of life. Beauty. Oh, yes the poverty is here. Make no mistake, there is no missing that, but there is beauty as well. I suppose that is all life, dear sisters, room for poverty- physical poverty- poverty of spirit- poverty of finances- and beauty- beauty in the world around us- beauty in life- beauty in laughter. Poverty. Beauty. Dwelling side by side. And Kolkata is one of those places for me. It has captured my heart. My heart aches for the poverty and suffering that takes place in this city and the breath-taking colors of the city. Our team of therapist have come to Kolkata (yes… it used to be spelled Calcutta in case you were wondering) to teach at a three-day workshop on trauma, sexual abuse, therapeutic techniques and self-care for social workers and other staff members from multiple anti-trafficking organizations. But, before the conference started we were itching to get out among the people and do a little sight-seeing. We hit Victoria Park, the market place, Dominoes Pizza (oh yeah, we were a little too excited to see something that felt like home) before heading to our last destination, the home of Mother Teresa. Ahhhh, Mother Teresa. Like, Mother Teresa. 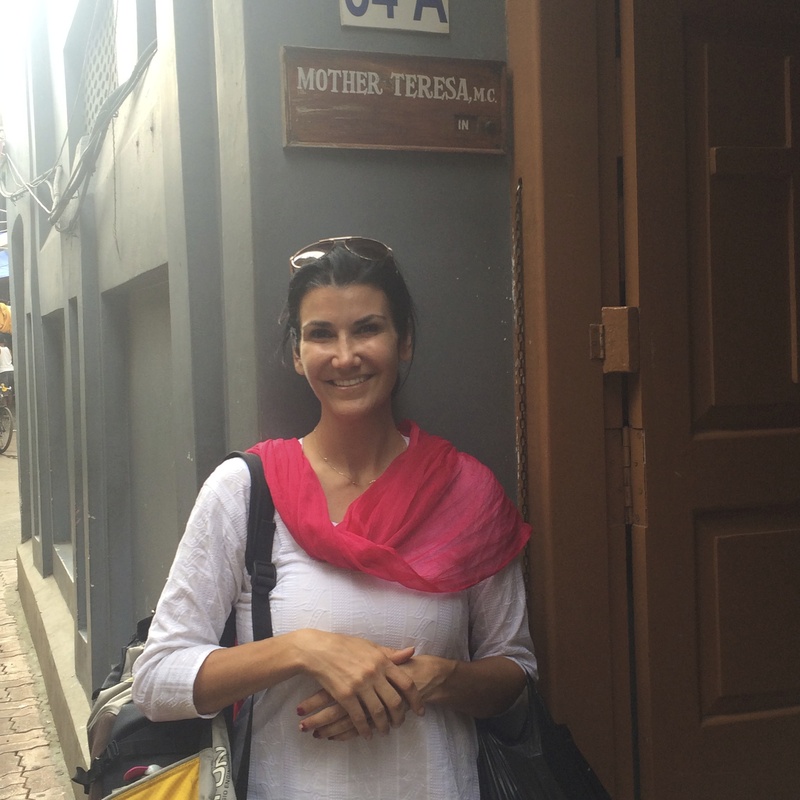 The Mother House, is where Mother Teresa stayed when not at the individual centers where they cared for those off the streets- lepers- prostitutes- abandoned children. This is where the sisters and volunteers continue to be trained to this day. And although I am not catholic, I ‘m kinda crazy about this woman. I love her message and what she stood for. Her love for not only the physically poor, but those poor in spirit, particularly those that are lonely and unloved. But as we visited her house today, taking in her tomb and her room, it wasn’t the greatness of Mother Teresa, as profound as that was, that left be forever changed. I had finished wandering around and was waiting by the front gate for the rest of my team. In the same place, there also sat two sisters (sisters… as is blue and white-robed catholic sisters) who were handing out magazines and greeting visitors as they came. One struck up conversation with me, asking where I was from and wanting to know about my family. Her name was Sister Ruth. While having had neither husband or children, Sister Ruth offered up plenty of advice on how I was to raise my children. You gotta love that. I smiled and listened to what she had to say. She would stop every now and then to greet someone she knew who walking through the gate. It was near the end of our conversation that Sister Ruth chatted with a woman leaving the building. She look as if she was in her 60s, and hobbled a little as she left. “You see that woman, “ Sister nodded towards the door, after her friend had turned the corner and headed out onto the street. I nodded my head, acknowledging that I did. My eyebrow raised a little, impressed with this woman’s dedication to care for the poor.I wondered what her story was for a brief moment, but realized the sister was waiting for me to respond. Wait… what, I thought to myself, that dones’t make sense. I was having such a hard time comprehending all that she blurted out within a matter of seconds. Like, she was going to die if they didn’t take off her legs. Quickly trying to process it all…She is giving up her own life. She is risking her own life. Her words lingering in the air. I swallowed hard, letting go of a little cry within my chest. Oh, God, to love your people like that. To love them in such a way that you look at life differently. You choose differently. That your choices are made out of love, to love the least of these. Now,I know for some this would seem insidious, but I thought it was beautiful. As I finish my day, I cannot shake the glimpse that I had of this Italian woman. I se her figure, her hobbling figure. Her hair. I see her walking before me and gone in a moment, for in that split moment I caught a glimpse of greatness. A greatness that very few will behold with their eyes. A greatness that never receives the applause or attention it deserves, yet, for the one to whom it matters most, it does not escape. Greatness. Unlike anything I have seen. Greatness. Just a glimpse of greatness and I am forever changed.